Session F (2011) Scientific advisory committe (SAC). InWorkshop on the establishment of a Vessel Monitoring System (VMS) in the 2011 Oct 29. Ikhwanuddin M, Liyana AN, Azra MN, Bachok Z, Abol-Munafi AB (2014) Natural diet of blue swimming crab, portunus pelagicus at Strait of Tebrau, Johor, Malaysia. Sains Malaysiana 43: 37-44. Kalayci F, YeÅilçiçek T (2014) Influence of season, depth and mesh size on the trammel nets catch composition and discard in the Southern Black Sea, Turkey. Marine Biology Research 10: 824-832. Daskalov GM, Zylich K, Pauly D, Zeller D. Fisheries Centre. Hamid A, Wardiatno Y, Batu DT, Riani E (2015) Changes in proximate and fatty acids of the eggs during embryo development in the blue swimming crab, Portunus pelagicus (Linnaeus 1758) at Lasongko Bay, Southeast Sulawesi, Indonesia. Indian Journal of Science and Technology 8 : 501. Balev D, Ivanov G, Dragoev S, Nikolov H (2011) Effect of vacuumâpackaging on the changes of Russian sturgeon muscle lipids during frozen storage. European Journal of Lipid Science and Technology 113: 1385-1394. Abdul H, Yusli W, Batu DT, Etty R (2015) Changes in Proximate and Fatty Acids of the Eggs During Embryo Development in the Blue Swimming Crab, Portunus pelagicus (Linnaeus 1758) at Lasongko Bay, Southeast Sulawesi, Indonesia. Indian Journal of Science and Technology 8: 501-509. Ünlüsayin M, HÄdÄrugÄ NG, Rusu G, Gruia AT, PÄunescu V et al. (2016) Nano-encapsulation competitiveness of omega-3 fatty acids and correlations of thermal analysis and Karl Fischer water titration for European anchovy (Engraulis encrasicolus L.) oil/β-cyclodextrin complexes. LWT-Food Science and Technology 68: 135-144. Ayas D, KöÅker AR, DurmuÅ M, Bakan M (2016) Determination of seasonal changes on some heavy metal (Cd, Pb, Cr) levels of shrimp and prawn species from North-Eastern Mediterranean Sea, Gulf of Mersin, Turkey. J Aquacult Eng Fish Res 2: 42-49. Küçükgülmez A, Celik M (2013) The effects of natural antioxidant extract isolated from giant red shrimp (Aristaeomorpha foliacea) shells on fatty acid profiles of anchovy (Engraulis encrasicolus) during refrigerated storage. Journal of Aquatic Food Product Technology 22: 66-76. SevgiÌliÌ H, KurtoÄlu A, Oikawa M, Mefut A, Süyek R (2012) The Use of farmed salmon oil to replace anchovy oil in diet of turbot, Psetta maxima, reared in brackish water. Journal of the World Aquaculture Society 43: 560-570. Zhao L, Wu H, Zeng MY, Huang H (2016) Nonheme Iron-Loading Capacities of Anchovy (Engraulis japonicus) Meat Fractions under Simulated Gastrointestinal Digestion. Journal of Agricultural and Food Chemistry. Kathirvel K, Eswar A, Manikandarajan T, Ramamoorthy K, Sankar G, et al. (2014) Proximate composition, Amino acid, Fatty acid and mineral analysis of box crab, Calappa lophus (Herbst, 1782) from Parangipettai, Southeast Coast of India. J. Environ. Sci. Toxicol. Food Technol 8: 50-57. Ghahfarrokhi KN, Ghaeni M, Zaheri L (2014) Effect of Seasonal Changes in Fatty Acids Profile of Orange Fin Pony Fish (Leiognathus bindus) and Sulphur Goatfishes (Upeneus sulphureus). International Journal of Aquaculture 4. Dissanayake AA, Wagner CM, Nair MG (2016) Chemical Characterization of Lipophilic Constituents in the Skin of Migratory Adult Sea Lamprey from the Great Lakes Region. PloS one 11: e0168609. YILMAZ E (2016) Elekçi IrmaÄÄ± (Fatsa/Ordu) BalÄ±k FaunasÄ±. SDÜ Fen Dergisi 11. Santhanam R (2014) Nutritional Marine Life. CRC Press. Korkut AY, Kop A, Saygi H, Göktepe Ç, Yedek Y et al. (2016) General evaluation of fish feed production in Turkey. Turkish J Fish Aquat Sci. Ceyhan V, Emir M (2015) Structural and Economic Analysis of Turkish Fishmeal and Fish Oil Industry. 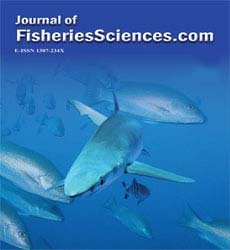 Turkish Journal of Fisheries and Aquatic Sciences 15: 841-850. Devi AS, Smija MK, Latha NP (2015) Fatty Acid Composition of the Freshwater Crab Travancoriana schirnerae. Fishery Technology 52: 246-251.